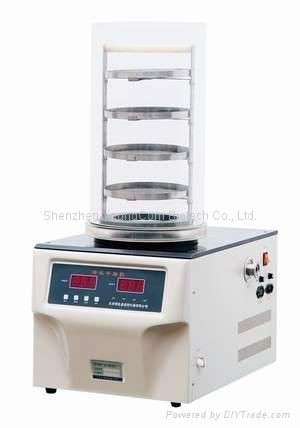 FD-1A-50 is suitable for treating bulk sample, the diameter of stainless steel sample tray is 200mm, total 4 layers. Sample about 1200ml (thickness 10mm)can be placed. Stainless steel sample holder is specially designed , also the space between sample trays is adjustable; numbers of layers can be set freely. Drying time:when the sample thickness not exceeding 10 mm, the drying time is generally about 24 hours.